India Birding Tours (Venture of "Indo Vacations"™) is one of the leading Tour Operator and Travel Agent, specialized in organizing tours throughout the Indian subcontinent having a large and efficient network. We organize tailor-made holidays to every state and cities of India, including Jammu and Kashmir, Ladakh, Gujarat, Rajasthan, Himachal Pradesh, Madhya Pradesh, Uttar Pradesh, Kerala, North East India, Sikkim, and Nepal. We are specialized in organizing tours throughout the Indian subcontinent including Nepal, Bhutan and all over India. We understand your needs when it comes to a tailor made tour. 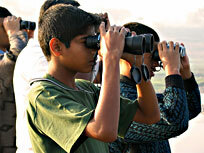 India Birding Tours offers you a wide collection of Birding Tours in India and Nepal. We not only organize the birding tours which are mentioned on the website but also make the changes if needed and work out any special tailor made birding tour itinerary as per the special wishes of the tourists. Few other areas of the world enjoy such a varied landscape as that of the Indian sub-continent, and the diversity of the scenery is fully reflected in the wonderfully rich bird-life. There are over 2,000 species of birds, although many of these are rare or of limited range, and the birds form the greater part of those likely to be seen anywhere in the area. There is a great difference between the bird-life of the hot, dry, open plains in the west and the steamy rainforests of the eastern border, and between the snowy peaks and pinewoods of the Himalayas. All these places have their own characteristic birds, locally distributed species which only live in their particular environment, whether it be hill-forest, lowland jungle or desert. In contrast, many of the common birds of India are very widely distributed. Some of the birds families which occur throughout the world’s tropics include Pelicans, Ibises, Trogons, Barbets, Parrots and Cuckoos, while the birds of prey, owls, crows and the shorebirds have a world-wide distribution. Many of India’s most characteristic birds are in families which only occur in the Old World tropics, such as Hornbills, Sunbirds, Bulbuls, Babblers, Cuckoo, Shrikes, while the Leafbirds or Fruitsuckers are confined to the Oriental Region. Families in which India is especially rich are the forest species which include Woodpeckers, Pigeons, Owls, Cuckoos, Pheasants, Drongos, Crows, Minivets, Babblers, Flycathers and Warblers. The best time for birding in India is from October to April. The duration of your tour can be as long as you like but we would suggest a one to two week Bird Watching tour itinerary in India to fully appreciate and enjoy the birding experience in India. We look forward to welcome you in India !